NETWORK FINALS: WINTER OLYMPICS coverage adjusted up 0.1. CABLE HIGHLIGHTS: USA’s WWE telecast topped Monday cable at 1.22/1.21/1.00, compared to last week’s 1.06/1.03/1.00. VH1’s LOVE & HIP-HOP was at 0.96/0.90, compared to last week’s 0.78/0.61. 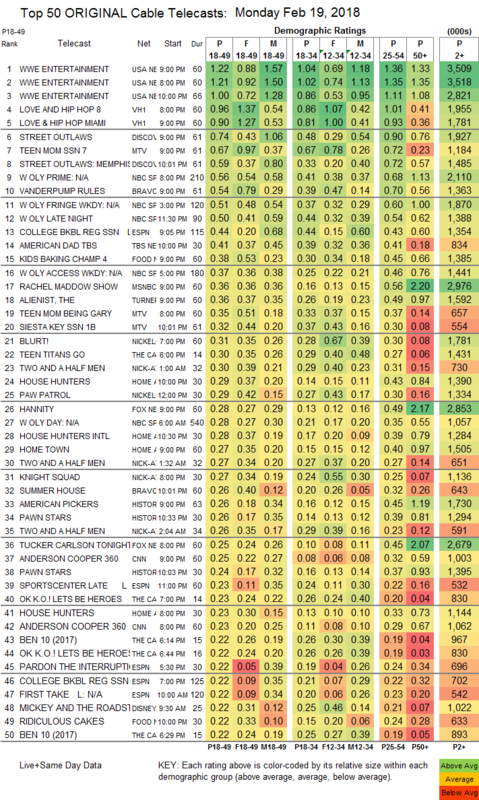 Discovery’s STREET OUTLAWS was at 0.74/0.59, compared to last week’s 0.79/0.57. On MTV, TEEN MOM rose 0.06 to 0.67 (with a preceding BEING GARY special at 0.35), and SIESTA KEY was down 0.02 to 0.32. NBC Sports Net’s WINTER OLYMPICS cable coverage peaked in primetime at 0.56. On Bravo, VANDERPUMP RULES ticked down to 0.54, and SUMMER HOUSE was up 0.04 to 0.26. ESPN’s COLLEGE BASKETBALL game was at 0.44. TBS’s AMERICAN DAD ticked down to 0.41. On Food Network, KIDS BAKING CHAMPIONSHIP gained 0.02 to 0.38, and RIDICULOUS CAKES was down 0.02 to 0.22. MSNBC’s RACHEL MADDOW SHOW topped cable news with 0.36/0.56/3M, over Fox News’s HANNITY at 0.28/0.49/2.9M and CNN’s ANDERSON COOPER 360 at 0.25/0.32/1M. 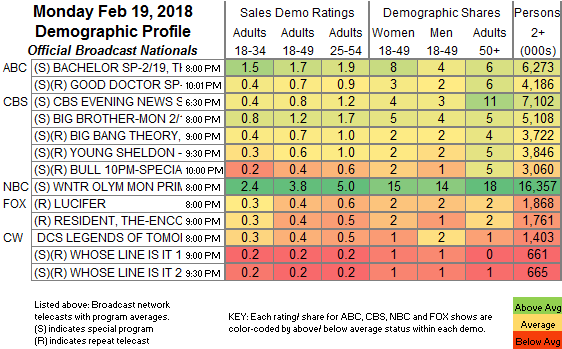 TNT’s THE ALIENIST fell 0.05 to 0.36. Nickelodeon’s BLURT was at 0.31, with simulcasts on TeenNick at 0.06 and on Nicktoons at 0.04/209K. KNIGHT SQUAD was at 0.27 on Nick At Nite, simulcast on TeenNick at 0.05/177K and Nicktoons at 0.02/91K. On HGTV, HOUSE HUNTERS was at 0.29/0.23 compared to last week’s 0.25/0.19, and HOUSE HUNTERS INTL was up 0.06 to 0.28. History’s AMERICAN PICKERS was at 0.26, and PAWN STARS was at 0.26/0.24. On ID, MURDER IS FOREVER dropped 0.06 to 0.21, and VANITY FAIR CONFIDENTIAL was down 0.04 to 0.18. Paramount’s COPS lost 0.03 to 0.14.